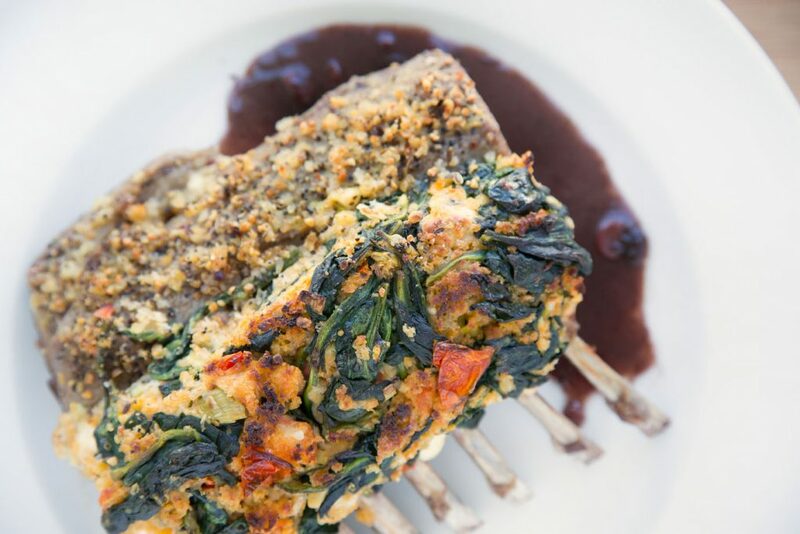 Cook up deliciousness just like your favorite restaurant my with my stuffed rack of lamb. It's easy to make and will definitely be a show stopper! 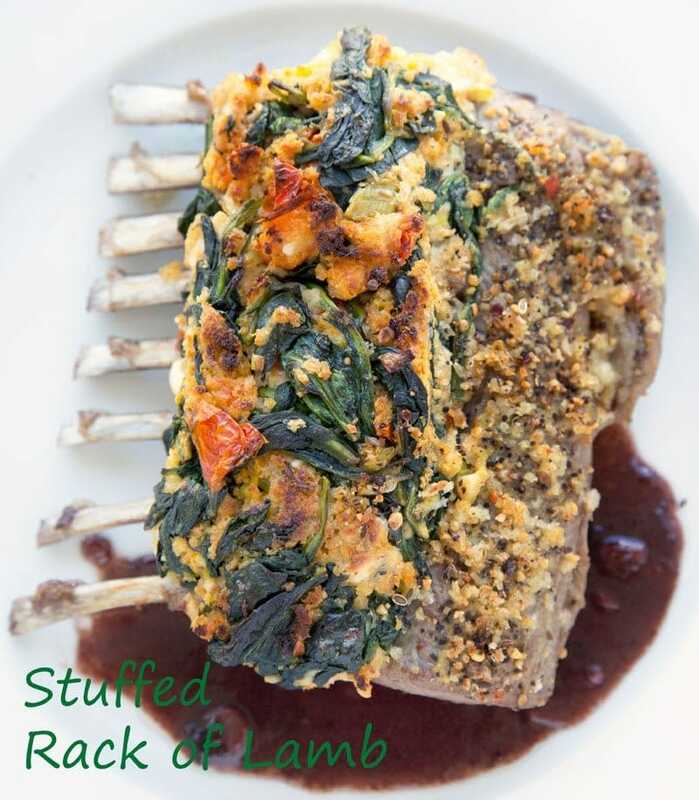 Restaurant Style Deliciousness just got easier with my Stuffed Rack of Lamb! 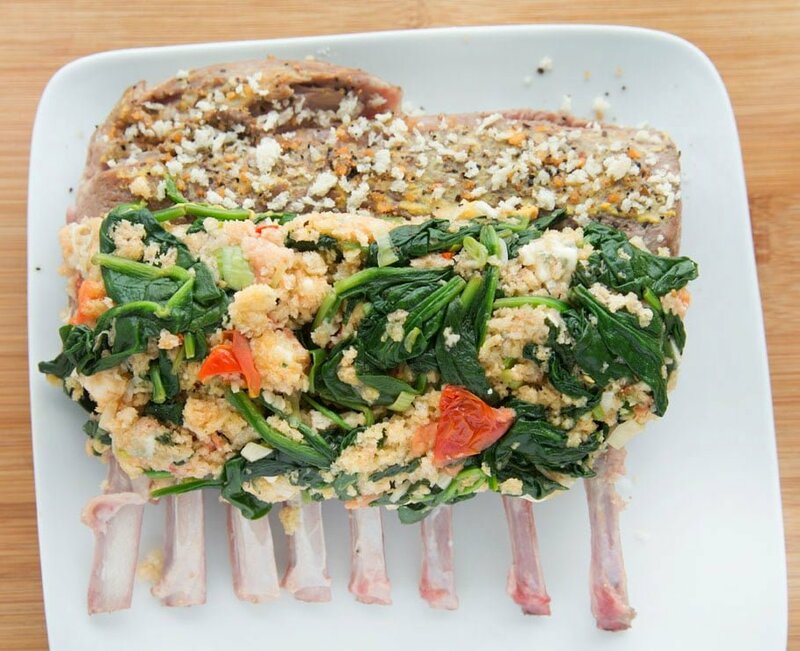 If you’re looking for a show stopper for your next dinner party, or for an extra special dinner at home, my Stuffed Rack of Lamb is exactly what you’re looking for. 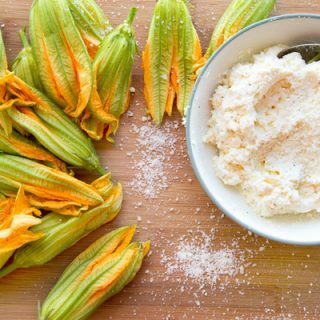 Let’s get our ingredients ready (aka mise en place). Lamb racks come two to a cryovac pack, so keep that in mind when purchasing them. You’ll find lamb is very expensive at your local grocer, but big box stores like Sam’s Club usually have them at a much better price, and I’ve found the quality of their lamb to be excellent. 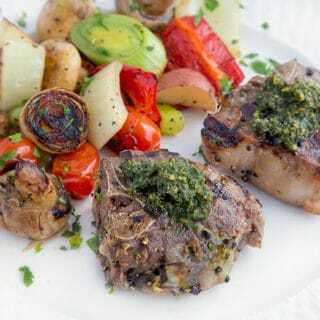 You’ll find that New Zealand lamb is smaller than the American variety and fairly mild in flavor. 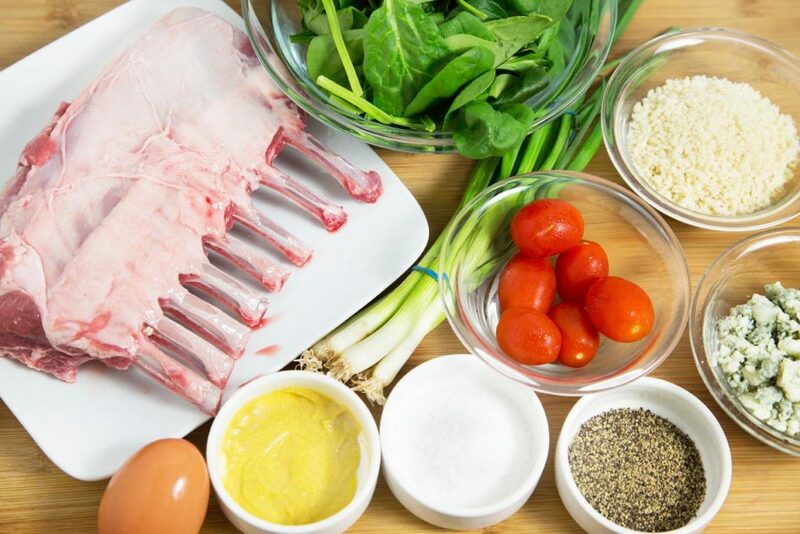 Once your ingredients are combined all the hard work is done and your stuffed rack of lamb is ready to roast. The only thing you have left to do to make this an over the top meal is to make a demi-glace for the lamb. It’s simply a stovetop reduction that will produce restaurant style results faster and easier than you thought possible! Saute spinach until it starts to wilt, then add tomato halves and continue to saute for a minute, then add the chopped scallions and saute for another minute. Remove the spinach mixture from the heat and allow to cool. After the spinach mixture has cooled down a bit, place the mixture in a strainer and squeeze out as much of the liquid as possible in the strainer. Place the spinach mixture into a mixing bowl and add the bread crumbs, cheese and egg. 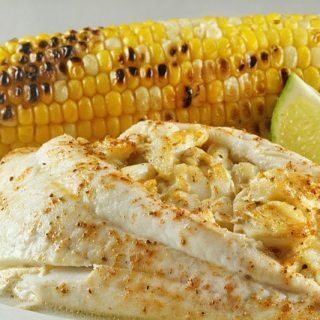 Mix well and season with sea salt and black pepper to taste. Take half the mixture and place it in the little gully between the high part of the lamb rack and the bones. Mound the stuffing evenly distributing it along the rack of lamb. 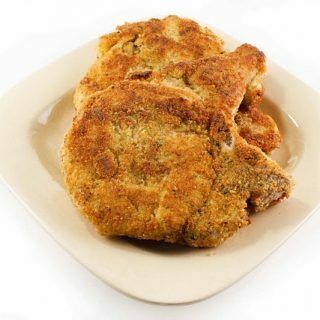 Repeat the process with the other rack, then season them both with a teaspoon of Montreal brand beef seasoning (or just cracked black pepper and sea salt) then sprinkle the meat with a little of the panko bread crumbs. 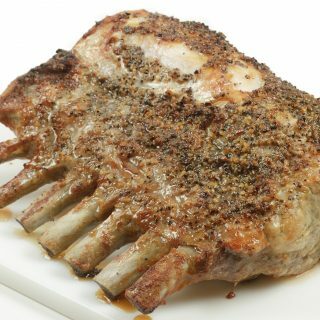 Place the Rack of lamb in a 400 degree preheated oven for about 20 minutes. Temp the lamb using a thermometer until it reads 125 degrees ( the internal temperature will rise 5-10 degrees more after removing from the oven) Allow lamb to rest 10 minutes before cutting. Place chopped shallots in a small sauce pan over medium heat. Add red wine and beef stock. Bring mixture to a boil and allow to reduce by 50%. Add butter rolled in flour to thicken the sauce, continue simmering on low for about 20 minutes or until reduced by half again. Sauce should be thick enough to coat the back of a spoon. You want to the sauce to be thick enough to remain stationary on the plate, it should not be watery. Add any lamb fat that was in the roasting pan to the sauce to kick up the flavor a little more. Add sauce to plate , starting in a corner of the plate so you can see some of the sauce, then position the stuffed rack in the center of the plate and serve. 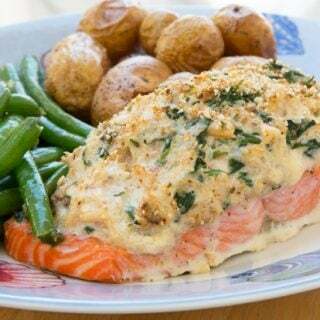 You can easily serve a half a rack per person with a seafood item for a surf and turf dinner! My husband and son love lamb rack! This looks fantastic! Definitely something that my family will enjoy! I’ve never made lamb before, but it seems pretty simple to cook. Worth giving this recipe a try. That looks delicious delicious stuffed rack of lamb. You make gourmet meal with simple ingredients. Oh wow. Lamb dish is kinda of pricey and a luxurious meal for us. This looks so delicious! Wow this meal looks straight out of a fancy restaurant! I wonder if I can get my husband to whip this up. Perfect for our Easter dinner coming up. I love the step by step directions. If I follow your lead, it comes out perfect every time. I’ve actually never had lamb before. My Nana used to LOVE it though. Lamb is a meat I’ve never tried to prepare at home. Where I live, I’ve never seen it offered in stores! I wouldn’t mind trying this if I could find lamb meat. Lamb isn’t something we can usually afford, it is very pricy at the butcher shop. I have had it before and enjoyed the taste. My family is big on meat, and lamb is a rare one they enjoy. I bet they would really like recreating this recipe for a special occasion. Oh my goodness this sounds absolutely incredible. I would love to have this for dinner one night, I bet it is so full of flavour! This looks so incredible. It’s been ages since I’ve had lamb. I really need to make it one evening. I bet the kids would like it! Oh my gosh does that look amazing! Rack of Lamb Is absolutely delicious anyway but the way you made it here I wish you lived close enough that I can stop by and grab some from you LOL. Well now doesn’t this just look insanely fancy and delicious! To the best of my knowledge, I’ve never eaten lamb! But this looks absolutely amazing. What a wonderful meal! I really love the lamb. I was amazed at you recipe. It’s perfect. I’ll give this a try. Thanks for your post. This looks amazing! I love rack of lamb, but have not had it stuffed, so will give it a try!! I’ve never cooked or eaten lamb but I know people that have and they love it. Lamb is my favorite protein. I so enjoy cooking it, and it’s always a hit at any gathering I have. 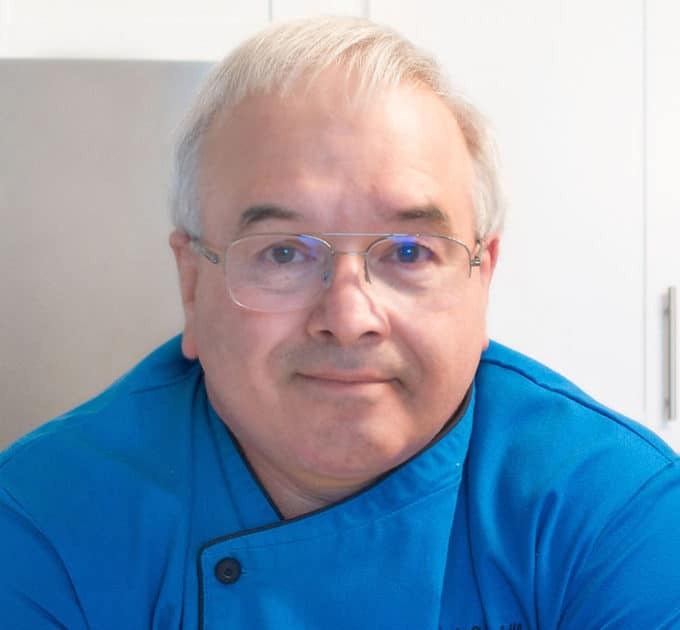 I especially seek recipes that have different toppings – and I look forward to trying this recipe. Thanks for sharing! Wow!! This stuffed rack of lamb looks so delicious and really tempting. My husband would love this so much. I will absolutely shared this to him. That looks amazing! I can’t imagine ever being able to make that myself! I’ve never cook lamb before but this looks so delicious that I got to try it. My hubby likes lamb so I know he’s going to be very pleased. Thanks for the recipe! Wow, this dish is beyond beautiful! I’ve never tried lamb before, but I have heard that it is amazing! This is delicious recipe and i think we do have all the ingredients for it. I think we will give it a try and taste it. It would be selfish if i dont thank you, so thank you so much for providing it to us! I never even thought of cooking a rack of lamb, it sounds amazing but a little scary! Wow, this looks absolutely amazing! I will have to try this recipe.